Kurt Hentschläger and Ulf Langheinrich (Granular-Synthesis) create symphonic performances and sin-aesthetic installations immersing and overwhelming the human sensory apparatus with an intense fabric of ambient sound, subsonic frequencies and synchronized multi channel video. Both artists also have solo projects available on tour. <360> © Peter Dimakos, Justhuman Workshop <360> is a spectacular architectural construction. 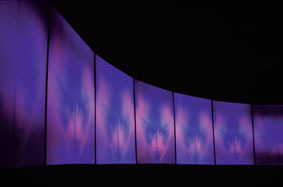 A wall of sixteen audio-video projections creates a complete 360-degree panorama fully engulfing the audience with sound and images. 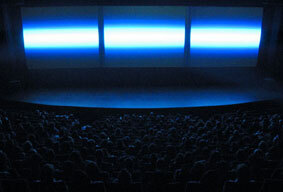 The 2D version was premiered at Villette Numérique 2002, Paris (FR). 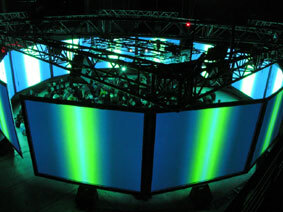 The 3D version was premiered at the ZKM Karlsruhe (DE) in September 2017. Available as a performance or an installation. 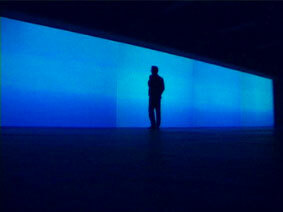 POL © Emmanuel Valette Granular-Synthesis' masterpiece POL (1998-2008) was premiered in its final version, as the closure event of the Romaeuropa Festival in December 2008. The work is available as performance or installation. AREAL © Granular Synthesis The performance AREAL was originally a surround environment featuring multi screen projection, a spatial sound set-up and substantial sub-bass. 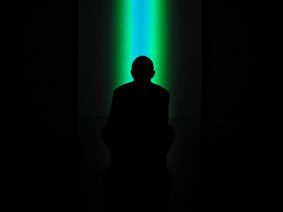 AREAL invites the audience to what the artists consider to be electronic reflections on natural phenomena of light and sound. 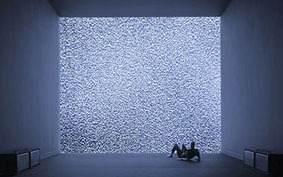 It is the newest release within a sequel of abstract installations and shows such as LUX (2003), <360> (2002), MINUS (2002), RESET (2001) and FELD (2000). MODELL 5 © Granular Synthesis MODELL 5 is a performance or installation in which the face of Japanese performer Akemi Takeya is subject to drastic time-based interventions that create in essence a cyborg-like hybrid, between human and machine. A roller coaster dramaturgy following the "life" of the four clones on screens. LUX © Granular Synthesis This installation forms part of the artists abstract collection. It is a powerful and immersive piece especially designed for small to medium size venues. RESET - simmulation © Granular Synthesis Over the past decade their works have evolved a critical algorithmic intelligence aimed less and less toward the fulfillment of grandiose phantasies of deathless electronic life, and more and more at examining the limits of perceptibility, the margins of representation, the micro-analysis of sound and feedback, the extension of the infinitesimal. FELD © Granular Synthesis An ever-modulating line of prismatic light horizontally along the screen interacts with the crashing modulations of sound. The current version of this installation is FELD 2.0. FORM © Granular Synthesis Video samples from a seven minute performance of Michael Ashcroft recorded in 1995 in Cardiff have served as a source of inspiration for many years. 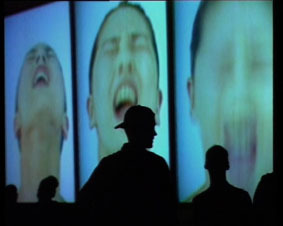 FORM was originally commissioned as a contribution to Robert Lepage theatre show Zulu Time and later on became reedited again and, in its final edition, had its last public appearance at the PS1 Clock tower in New York.